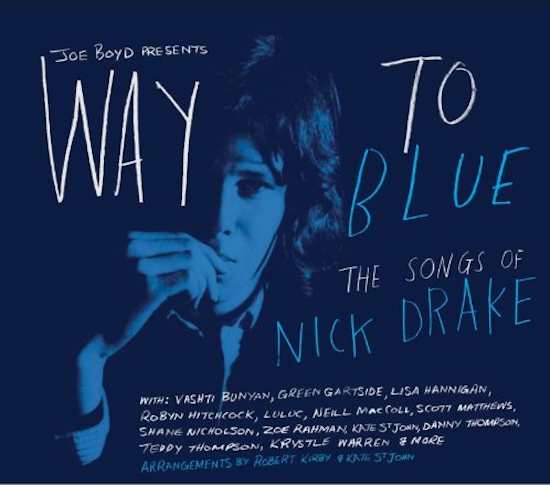 On April 15, Navigator Records will be releasing Way To Blue - The Songs Of Nick Drake (artwork above), a selection of interpretations of Drake's songs by Robyn Hitchcock, Vashti Bunyan, Scritti Politti's Green Gartside and others, recorded in concert in London and Melbourne. To celebrate the release, Joe Boyd, Drake's producer for his first two albums and the curator of the compilation, will be hosting an ace night of performances at Wilton's Music Hall on April 2. Boyd will be discussing the project and his experience of working with Drake, while the live set will feature Hitchcock, Gartside, Neill MacColl, Kate St John, Paul Smith of Maxïmo Park and Olivia Chaney. For tickets, head here. In further Nick Drake news, Island will be reissuing Bryter Layter, his second album, on heavyweight vinyl, remastered from a copy of the now-unusable master tapes by its original engineer John Wood. It comes in an impressive set, featuring "a copy of the original shop poster, a smaller 'Live' poster/brochure and a reprint of Nick's handwritten set list together with reproductions of the master tape reel and tape box lids" along with the full array of download formats.